Prior to this event, following the previous one, Reyna and Thorvald left Nightriver and headed back to Onsallas Village. From there, they met with various people and proceeded to rejoin Stanrick and Selena in Spiritclaw territory. Once there Stanrick joined the group (through Selena stayed behind to assist with Spiritclaw celebrations of the Spring Rites). They then proceeded back to Nightriver Territory, picked up Echo and joined with a caravan heading to the feasthall for the final leg of the journey. 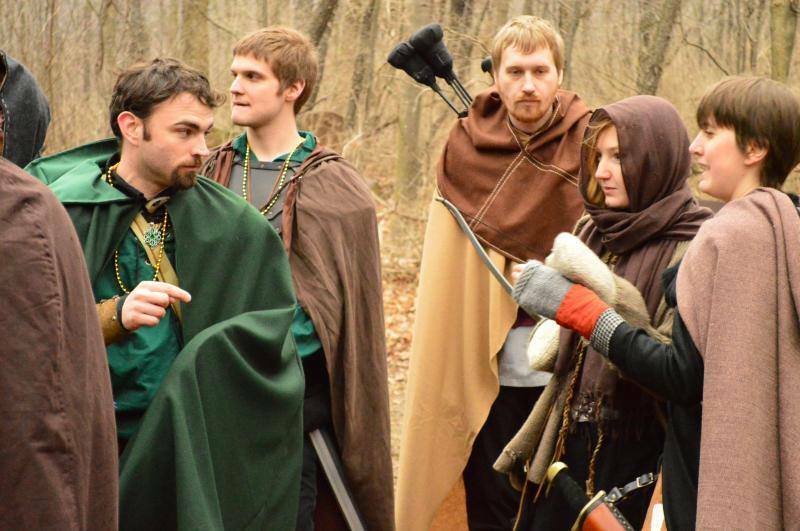 12 April 2014 – The group traveled in the company of a Lorespeaker, a group of Pheonix Syndar, various rangers, disreputable pirates, and a detachment of William’s Vandergon soldiers through Nightriver territory. Despite the rain, the journey itself was largely uneventful. Early in the Pirates took a prisoner from amongst them, though Reyna could find no reason to dispute matter and left the Pirates to their own affairs (Pirates are not to be trusted, after all). The Pheonix made each crossroad a moment of despair and a point in which the chances of heading the wrong way were greatly magnified every time they ignored Echo’s experience with the terrain. Once to the feastinghall a delicious meal was laid before all, and enjoyed greatly. The lack of Ulven was notable, though, as was the prevalence of various human and syndar amongst the gathering. Representatives from the Mardrum Trading Consortium were present, and between them, the Longfang and the Vandergon arrangements for the continued protection of Onsallas were made. A young Ulven child delivered a letter that had only recently arrived by Hawk and was meant for the hand of Stanrick Longfang. On reading it Stanrick stared for a moment, dumbfounded, and then sprinted from the room. He returned mere moments later, raced to Reyna and announced that he and Selena were to have a pup. The paid danced in a circle for joy as if they were pups themselves! Awhile thereafter, and seemingly due to a game of “mage tag” initiated by a Syndar, the pirates’ prisoner (to Reyna’s relief) escaped from their clutches. The celebration slowly broke up. The following day Stanrick, Reyna, Thorvald and Echo set forth for Onsallas. Selena was to meet them there and Stanrick wished nothing more than to make haste.